There's something appealing about The Music King's Build your own guitar kits which sell from £65 for a Strat copy to £89 for a Les Paul. You get all the components and hardware, with shaped but raw bodies and necks. I'm sure the quality isn't great - you're probably buying a cheap Chinese made guitar in pieces - but it would be a fun project. 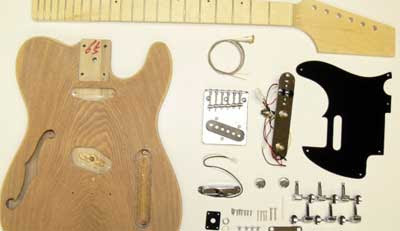 Brandoni sell rather superior kits at around £200, although the kings of self-assembly guitar kits are Warmoth, whose gallery shows just how far you can go wrong with this kind of thing. If you're looking for inspiration, WD Music have a fun but slightly clunky virtual guitar custom shop. If you're over in the states, you can pick up a kit from grizzly industrial for about the same price, taking the exchange rate into account. i have brought a couple of kits off the music king. These are brilliant value for money. I have built a strat and a LP style and have been amazed by the finished guitar on both occasions. Great value for money, would recomend to anyone! !